MVHS Girls JV Softball Team drop both games in Tournament Play. Looks to rebound Tuesday vs Monte Vista. Mar Vista High School Girls Junior Varsity Softball team drop both games in Tournament Play. Looks to rebound at home Tuesday vs Monte Vista at 3:30pm. Mar Vista Junior Varsity Softball team kicked off there season this weekend. They played in a double elimination tournament hosted by Otay Ranch High School. This years roster is headed by Manager Dan Alonzo. Players are Alina Alyssa McCoy Alyssa Ricks Anna James Gabriella Jackie Carbal Jazmine Nunez Leanna Salas Maddie Macias Nina Hammond Rebecca Romero Taylor Venessa Franco Yazandra Phelps. This ended the day for the Lady Mariners. All the players were in good spirits, knowing there is a lot of work ahead of them. Next game is Tuesday March 8,2016 3:30pm at Monte Vista High School. 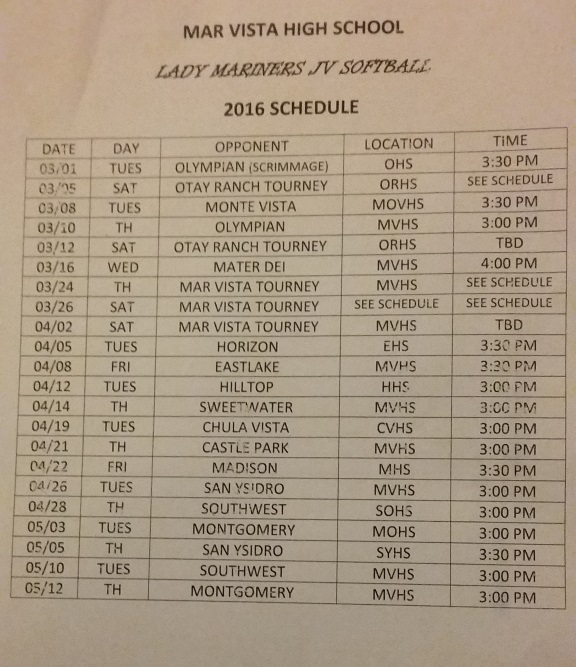 Come out and support the 2016 Mar Vista Junior Varsity Softball team. Schedule and games coverage, photos c/o Matt McCoy. We hpe to be able to cover Lady Mariners thanks to the help of Matt and Monique McCoy.